As a father I try to remember two things: my biological mission is complete and I am essentially fodder for the grave and my kids will probably destroy my smartphone. That’s why Pixlplay is particularly interesting. 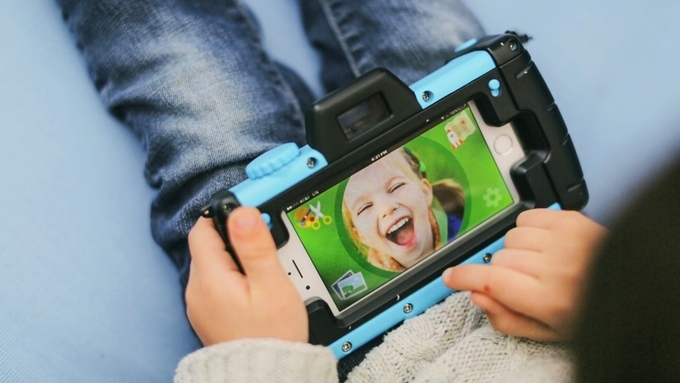 The Pixlplay is a smartphone case that looks like a big, bulky camera. You stuff the phone inside – it works with iOS phones for now – and plug a cable into the headphone jack. You can charge it via USB and the entire phone is well-protected thanks to the jolly candy-colored case. Kids can run around taking pictures with the included app or you can give up and give them Super Mario Run so they’ll shut up for fifteen minutes while you eat a damn grilled cheese sandwich in peace. The founder, JP Stoops, was toy buyer for the Discovery Channel Stores and spent fifteen years developing consumer products for others. He recently quit his job to make the Pixlplay and other products. The early bird model costs $20, a point that Stoops thinks will encourage parents and kids alike to give it a try. He wants parents to stick their old smartphones into the Pixlplay to give old tech new life. The team aims to ship in June. So as you drift into the inevitability of debilitation and death, remember this: your kids will remember you for the good you did in their lives and perhaps, when you are a vanishing memory as they spin wildly towards a future that has no part in it for you they will remember that moment when you let them take funny pictures with a big plastic iPhone case and smile. It’s the most we parents can hope for.